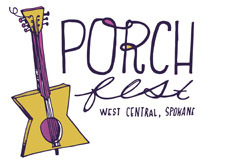 I first learned about Porchfest via my connections in the poetry scene, and was intrigued by the idea of bringing the arts home into our local neighborhoods. There’s a practice in the slam world, known as “ciphering,” which refers to setting up guerrilla poetry performances in public places, akin to a cross between street art and a flash mob. I was intrigued by that idea when I first heard of it, and have always wanted to find ways to inject art into ordinary people’s days. There’s this tendency where people in Spokane tend to think of arts and culture as something they have to go elsewhere to find, and this seemed like a great way to show them that it’s right here at home. 3- What have you been doing to build community? I’ve been very active since moving to Spokane, first with EWU’s Writers in the Community outreach program, and then later getting involved with the local poetry scene and providing a supportive space for people to come and learn to express themselves. Art is therapeutic in my experience, and whether it’s teaching creative-writing workshops to prison inmates out at Airway Heights, or supporting people as they learn to develop their voices upon the slam stage, I believe that what we do here has the power to unite and to heal. If I could do anything, I’d love to continue that work in other settings, be it with at-risk youth or with veteran’s groups. 4- Why should people attend this year? Come to Porchfest because you like free art. Come to Porchfest because you like free music. Come to Porchfest because you’ve never met half the people on your own block. Come because there are young poets and musicians in this town, right now, doing things that you will never find in places like Portland or Seattle. Come because you want to. Come because you have to. Come because you need this, more than you know.